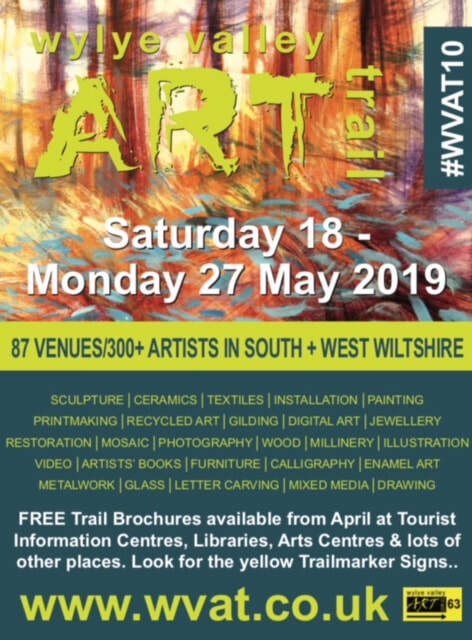 Our May exhibition which runs from the 10th to the 28th of May in Warminster Library will be part of this year's Wylye Valley Art Trail. 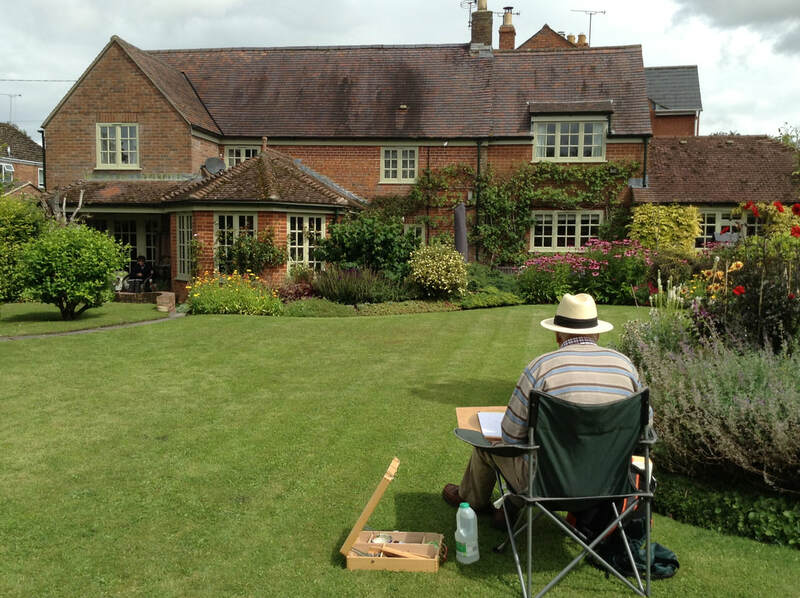 Prize-winning watercolour artist Jake Winkle returned one Saturday in March to lead a day-long workshop. Always a generous and inspirational tutor, he showed members how to achieve the effects he created in his demonstrations and helped them to produce their own variations on his animal theme. Members were delighted both with him and with the work they turned out. Our November exhibition in Warminster Library was very successful, with the sale of 18 paintings and 125 cards. 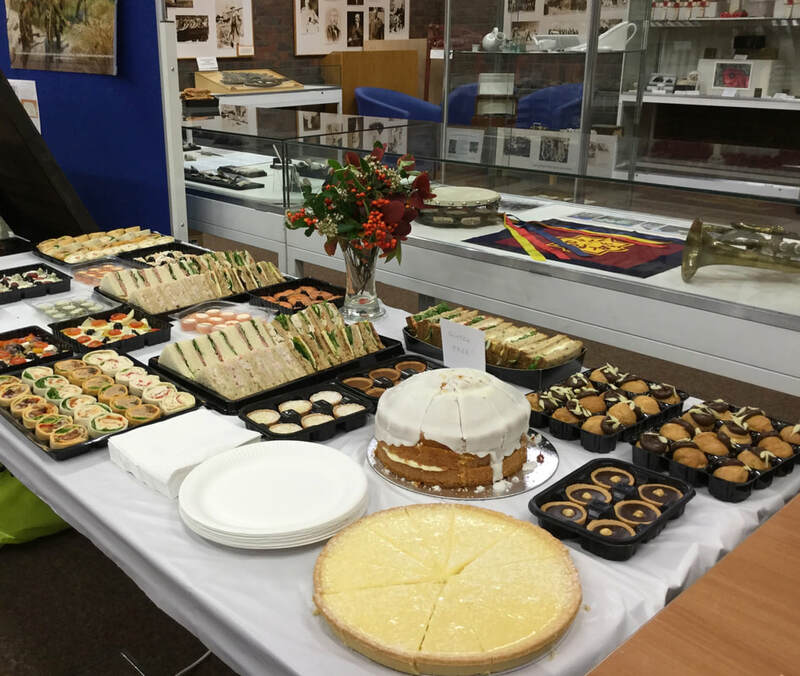 The preview was well attended and the magnificent buffet was enjoyed by all. Thanks are due to those who arranged this and to the members who helped to set up the exhibition and act as stewards. Without them, the show would not go on! The People’s Choice was won by Jane Dyer with her painting “Henrietta Hare”. Richard Lettington, WAS chairman, presented her with the Alfred Lilly award. Anthony Connolly treated us to a master class at our studio on a Tuesday afternoon in October. Anthony studied at Goldsmith's College and has paintings in many public and private collections including the Royal Collection. He is a member of the Royal Society of Portrait Painters and has received numerous awards. His wife modelled for the portrait while Anthony explained his process and thoughts. He also showed us slides of both his and other artists' work and discussed the merits (and otherwise) of different schools of painting. A thoroughly educational and satisfactory afternoon! 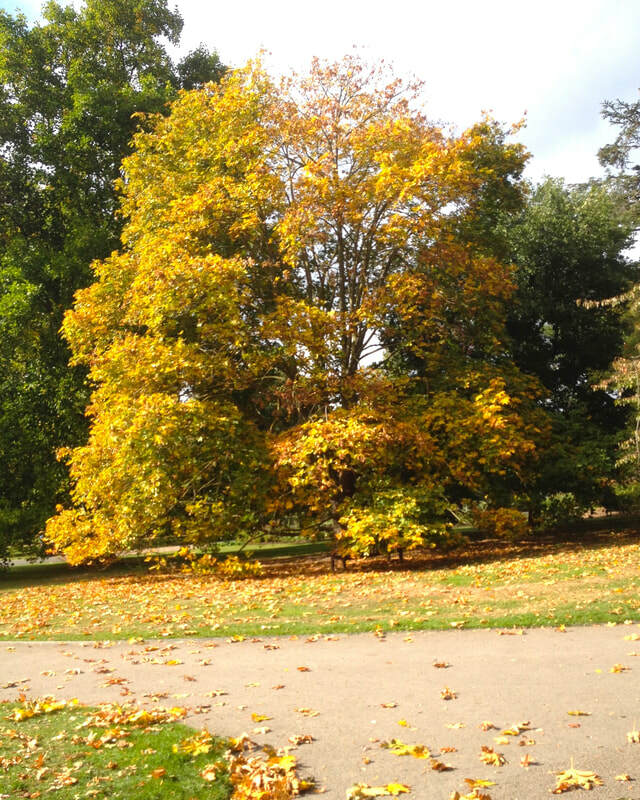 Our coach trip to Kew Gardens in early October caught the transition to autumn colours perfectly. We had a whole glorious day exploring the grounds and the many attractions. 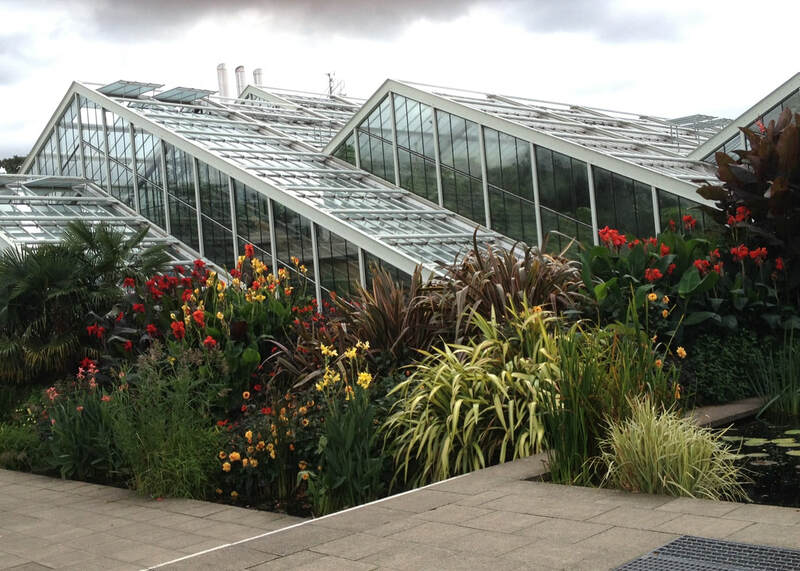 The Temperate house (the world's greatest glasshouse) has re-opened following a five-year restoration, and the Hive introduced us to the secret world of the honey bee. The Marianne North Gallery showed us more than 800 paintings of plants and the Treetop Walkway was a revelation. We had a fine day out. 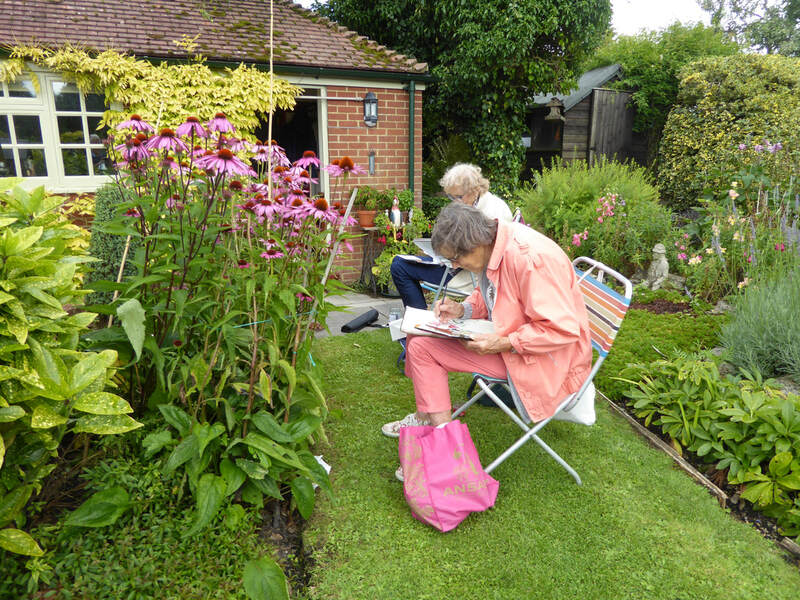 In June, members were inspired by an enthusiastic demonstration by Jake Winkle. Watching the picture materialise on the paper was amazing as he generously shared his tips and techniques with the class. Jake exhibits widely and in 2004 was a finalist in the Daily Mail's 'Not the Turner Prize' competition. In 2007 his work was selected for the Royal Society of British Artist's exhibition in The Mall Galleries, London, and he contributes regular articles for The Artist magazine. Jake has won best in show at Marwell International Wildlife Art Society's annual exhibition and in 2009 was awarded the prestigious St. Cuthbert’s Mill award for best watercolour at the Society of Equestrian Artists annual show. 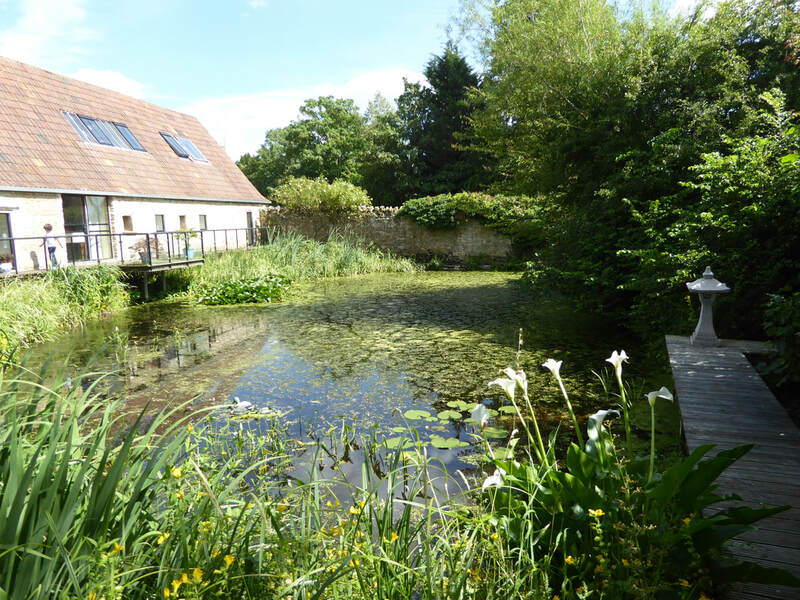 Jake demonstrates and tutors all over the country and runs his own workshops and masterclasses in Dorset. Marilyn Allis is a water colour artist who works in a loose and impressionistic style. She uses strong vibrant colours to capture the movement and energy of a scene, and at a Saturday workshop in early June, she introduced members to the delights of Brusho. The colours are a transparent, highly-pigmented water-colour ink that comes packed in small drums which contain the dry, crystalline powder in an extensive range of colours. They mix instantly with cold water to produce a vibrant and versatile painting medium. Marilyn demonstrated and then guided members through their own work. The results were amazing! ​at Warminster Library resulted in sales of 15 pictures and 115 cards. 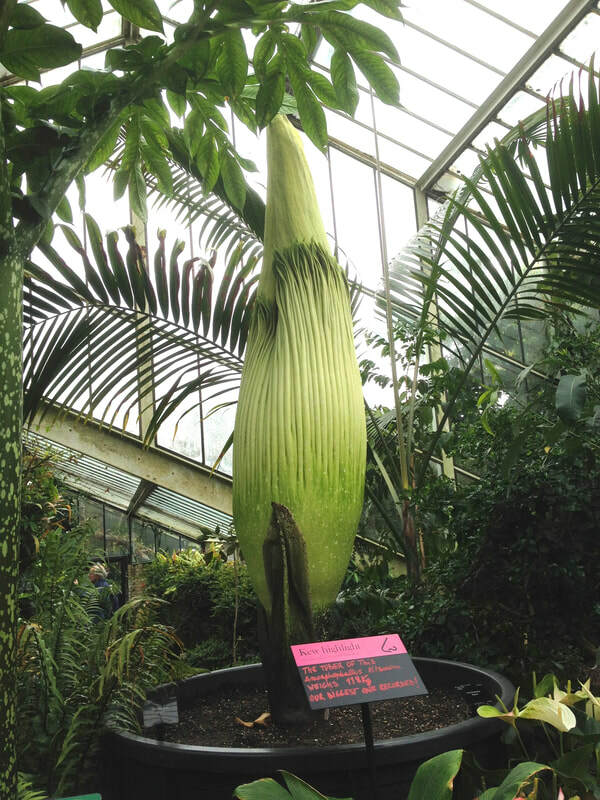 For the first time, the Preview was held on a Saturday afternoon. 60 guests and visitors came to view the entries while enjoying the open buffet and chatting to the artists. The People’s Choice award was won by Vivien Green with her portrait of her collie dog ‘Teddy’. Some of the exhibition pictures are now displayed at our new venue in Warminster Hub in the central car park. 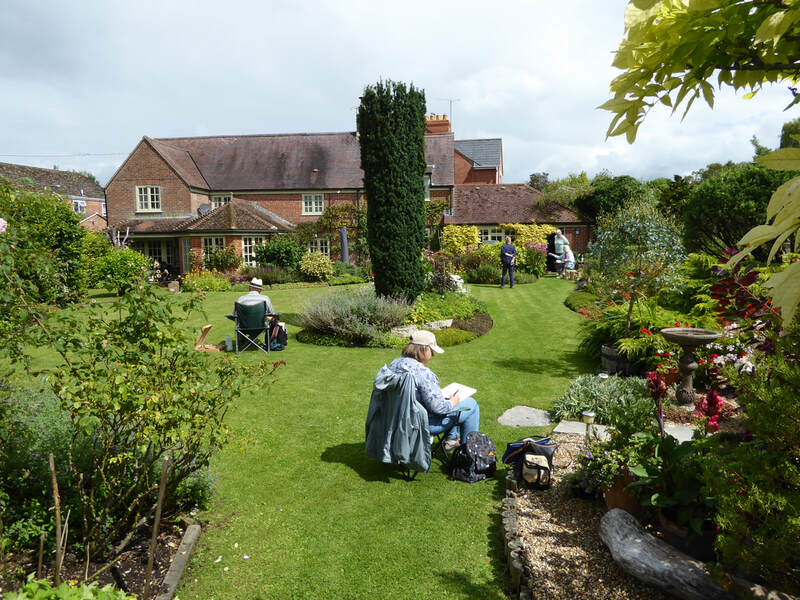 There are also examples of our members work in the Athenaeum and at Warminster Park Community Centre. Kate Cochrane gained a Diploma in Graphic Design Design at Canterbury College of Art followed by local courses in Fine Art and in colour work. She has been exhibiting paintings since 1980, has designed home accessories and runs tutoring workshops. In April, she ran a Saturday pastel workshop in Warminster, creating vibrant castles. 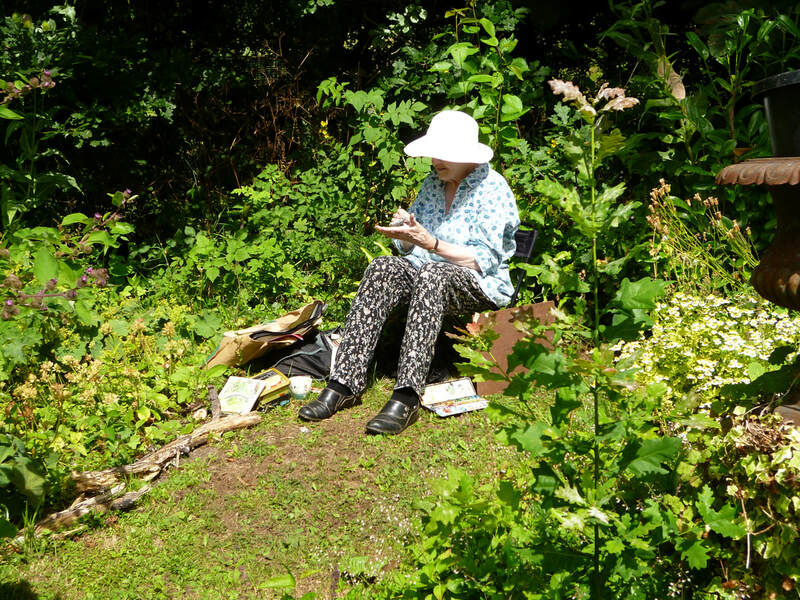 Kate works from her garden studio in Frome and the images she uses in her paintings are from places she has visited personally. Kate transforms what she sees into a mosaic of shapes and colour, considering hue, tone and composition. Local Somerset landscapes, visits to Tasmania, Wales and the Borders provide a wealth of images. 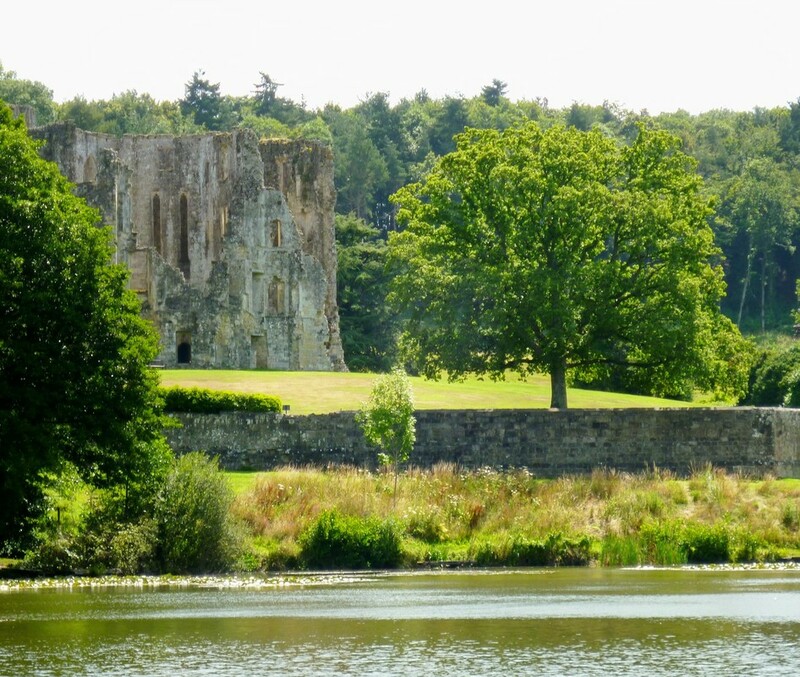 Her current interest is derelict castles and abbeys. 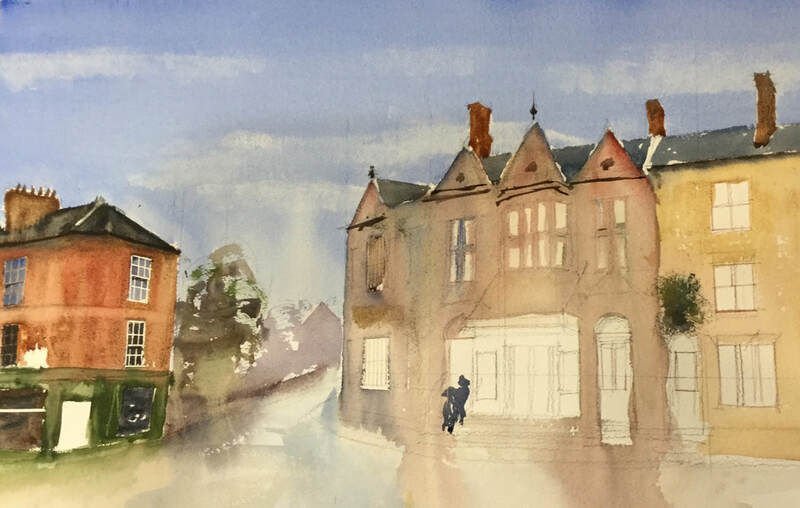 In February, Pete French gave a demonstration of how to paint buildings in watercolour and talked about his technique, the paint, brushes and the paper he uses. 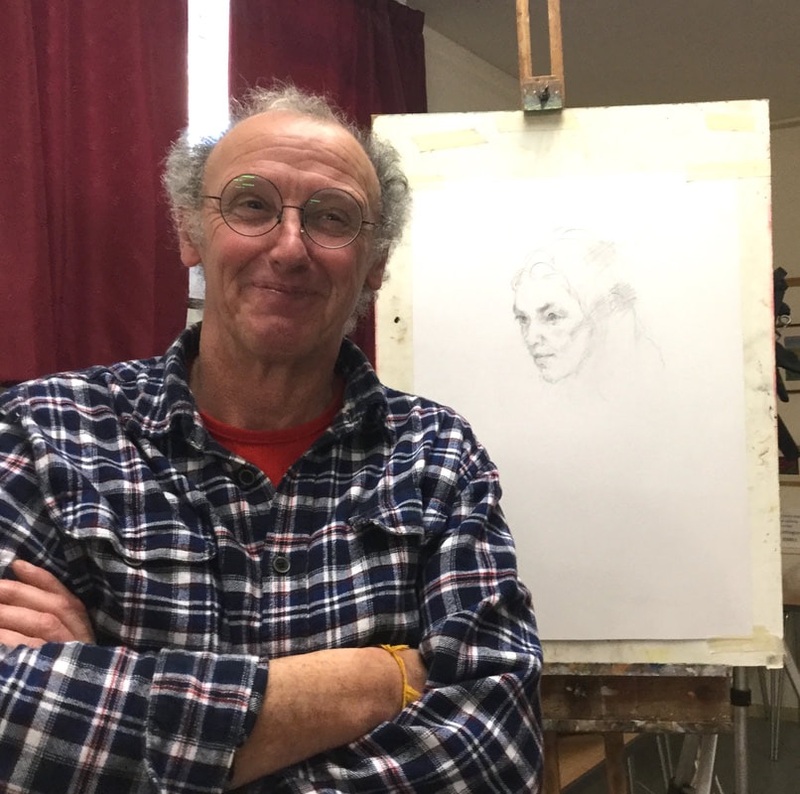 Pete has been a professional artist for 35 years, specialising in architecture, townscapes and landscapes. Water colour is his main medium but occasionally he switches to acrylic or oil. Recent Paintings have been exhibited in London Cork Street, The Mall Galleries and the Royal Water Colour Society Bankside. 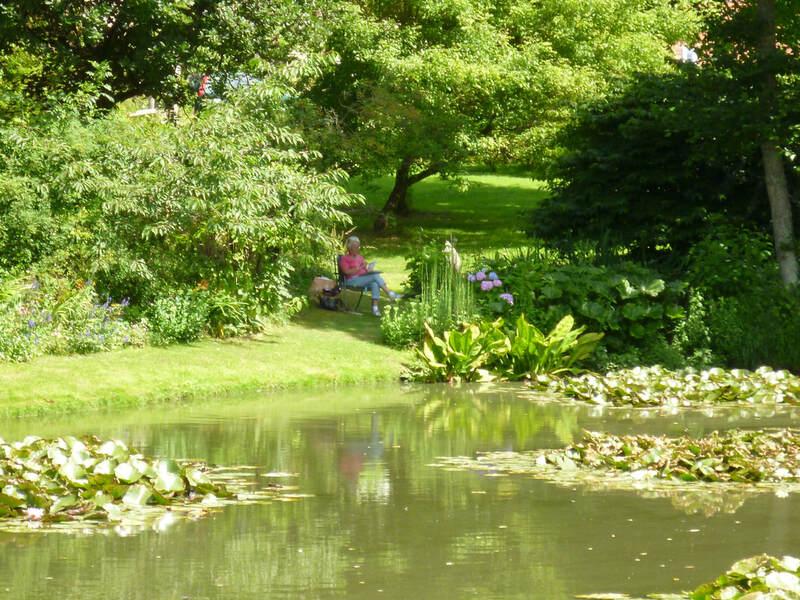 Other exhibitions have been with IEA at Holt, Stourhead Wiltshire, and also in Norfolk and Suffolk. Members especially liked the painting of Warminster. Visitors to the ​November Exhibition in Warminster Library who voted for the 'People's Choice' selected the oil painting by Kate Wikinson entitled 'The Jewel of Sutherland'. She was presented with the Alfred Lilley award by Janet Cooke, the Society's Chairman. Dave White came to us last November and returned this September to demonstrate the painting of portraits of dogs. He showed us how to prepare the canvas and then mixed shades of acrylics, starting with the darkest tones in the eyes and nostrils, demonstrating the techniques of layering and glazing. He showed how to create fur with a rake brush or comb brush and how to produce realistic whiskers by painting the edge of a piece of flexible card and applying it to the canvas. He will be be back next year to hold an all-day Saturday workshop and his book on animal portraits is due out In October 2018. 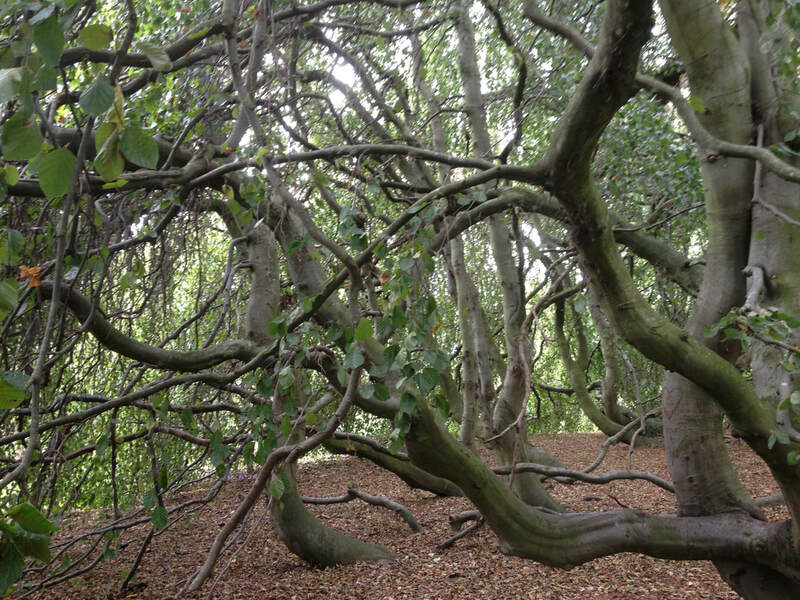 Pat Ebdon got the most votes in the competition for a postcard-sized picture of Autumn. 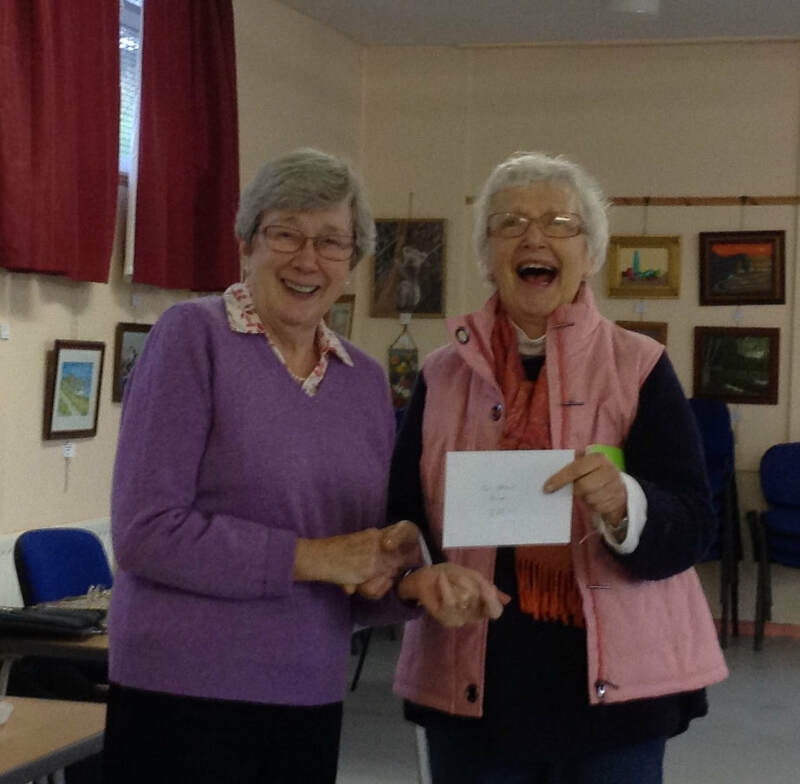 She was presented with the prize of £25 by Janet Cooke. 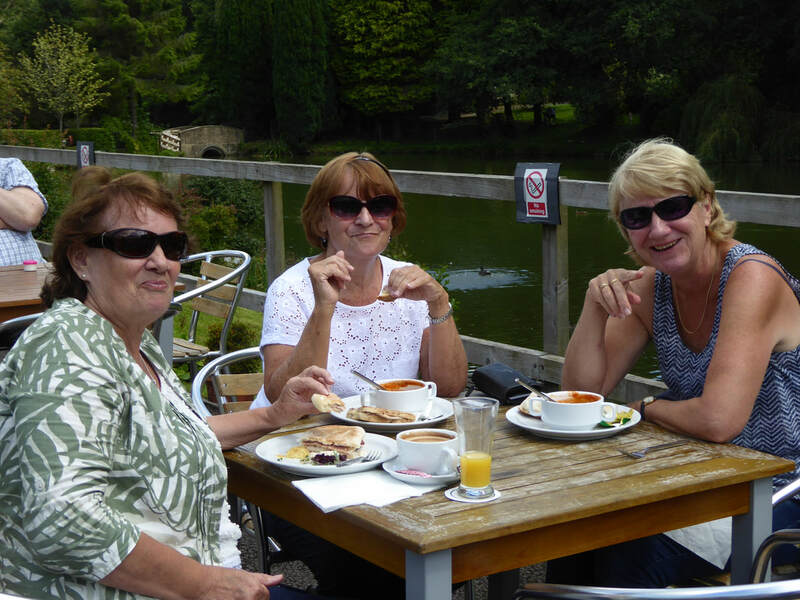 ​21 members came to the Lakeside Garden Centre in August where we drew and painted and had lunch. 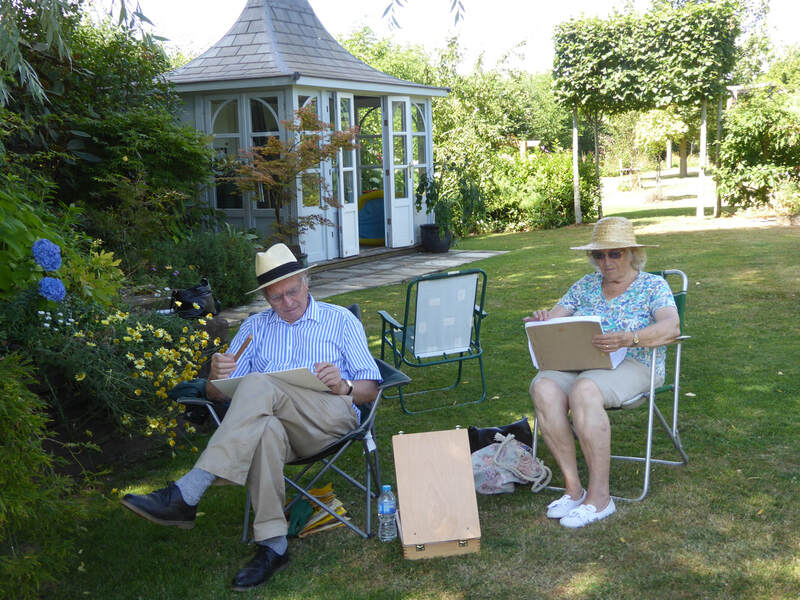 The first outdoor painting session this summer was at Ark Farm, Old Wardour.